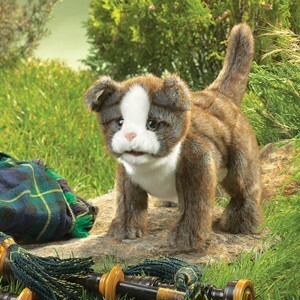 Folkmanis 2989 - Fancy the latest cat to the clowder: a sweet faced Scottish Fold Kitten. A newly popular and distinctive breed, this puppet features unique folded ears and a rounded face with large, broad-set eyes that convey this kitty's need for affection. Play with the moveable mouth and front paws of this white and blue-grey beauty and you'll see that she is a purr-fect companion! Movable mouth and forelegs. Puppet measures 12� x 6� x 10�.